For many people, an essential part of any theme park vacation is the roller coasters; others suffer roller coaster phobia. If you suffer from roller coaster phobia, you may wonder how to get through your next theme park vacation. To understand roller coaster phobia, it is necessary to first understand roller coasters. The original precursor to the roller coaster was the Russian Ice Slide, invented during the 17th century in Russia. Riders climbed a set of wooden stairs, slid down a 50-degree slope on a sheet of ice several inches thick, and then climbed up another set of stairs. The slides were so popular, it is rumored that Catherine the Great had a few installed on her property. It is uncertain who built the first wheeled roller coaster, although historians tend to lean toward the French. It is known that by 1817, two simple wooden coasters, with wheels that locked to the tracks, had been installed in French parks. Today, roller coasters may be created from either wood or steel. They use a combination of elements that may include chain lift hills, powered launches, steep inclines, and banked curves, as well as several types of loops including corkscrews, and even special effects, to invoke certain physical and emotional feelings. Roller coasters are intentionally designed to be scary, appealing to the same part of the brain that enjoys haunted houses and other Halloween events. We seem to be hardwired to enjoy activities that cause fear, provided that we know that we are actually safe. This phenomenon is demonstrated repeatedly in extreme sports, horror movies, and the multibillion-dollar Halloween industry. If our brains are hardwired to enjoy controlled fear, then why do so many people seem to suffer from roller coaster phobia? To answer that question, it is important to understand the basic psychology of fear as it relates to phobias. One aspect of anxiety disorders is the fear of fear. While most people are afraid only when confronted by a fear-inducing situation, those with anxiety disorders tend to worry that they will become afraid. They see fear as something negative, which must be avoided at all costs. A phobia occurs when the normal fear response becomes twisted. Objects or situations that are not inherently dangerous become the focus of fear. Although phobia sufferers know that their reactions are irrational, they are unable to control them. Roller coaster phobia appears to actually be based on several other phobias, any of which can be enough to trigger a fear of coasters. Acrophobia: The fear of heights is a generalized phobia that may cover any experience of being up high. Severity varies dramatically between sufferers, ranging from fear only above a certain height to the inability to even climb a stepladder. Acrophobia is sometimes confused with vertigo, a medical condition that can cause dizziness or a spinning sensation (at any height). Roller coasters tend to be tall, with long drops, making them challenging for those with a fear of heights. Illygnophobia: The fear of vertigo may be related to the fear of heights. However, those with illygnophobia are not afraid to be up high. Instead, they are afraid that looking down might cause dizziness and vertigo. Although the difference is subtle, it is important. Those with illygnophobia may be afraid even on coasters that do not go very high, as they worry that the banked curves and other features may lead to dizziness. Claustrophobia: By design, roller coaster seats are small and tight, and the restraints fit extremely snugly. This is necessary for safety but can trigger claustrophobia. Those who are uncomfortable with enclosed spaces often find that the worst part of a coaster is being locked down with no escape. Social Phobia: Some people do not fear the roller coaster itself, but instead worry that they will have an embarrassing reaction to the coaster. Roller coaster trains tend to be long and hold a number of people. Those with social phobia may worry that they will be judged for screaming, cringing, or otherwise reacting to the coaster’s movements. Particularly in teenagers, this fear may be enhanced if the fearful person’s friends will also ride. Mysophobia: On a roller coaster, it is impossible to maintain much distance between yourself and those around you. Those with mysophobia, or fear of germs, may worry about coming into contact with strangers. In addition, there is always the possibility that someone on the coaster will vomit or urinate, possibly exposing the phobic person to those bodily fluids. Emetophobia: The fear of vomiting is surprisingly common. Those who suffer from this fear may go to great lengths to avoid situations that they feel could cause an upset stomach. As roller coasters are designed to be unsettling, the physical sensations could cause someone with emetophobia to skip the ride. A fear of roller coasters is not necessarily a phobia at all. Instead, it may be a very real concern based on the individual’s medical history. Virtually all roller coasters, even those designed for children, carry standard health restrictions. 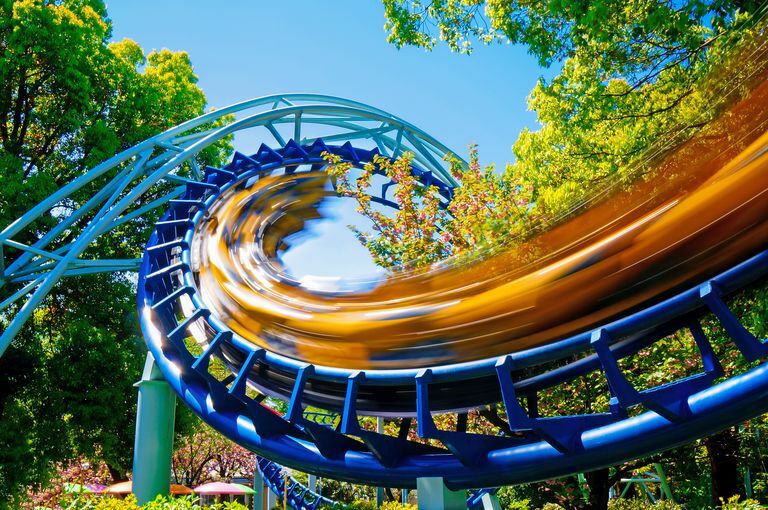 The exact restrictions depend on the coaster’s forces, but common considerations include (though are not limited to): heart conditions, back or neck disorders, motion sickness, high blood pressure, and perhaps recent surgery or casts. If you fall into any of the restricted categories, then it is best to err on the side of caution and skip the ride, at least until you have the opportunity to talk to your doctor about your safety and health. If you have determined that your roller coaster phobia is not based on a legitimate medical concern, then you may be interested in taking steps to minimize or overcome your fear. Fortunately, there are measures you can take to conquer your phobia and even learn to love roller coasters. Take a Class: Some theme parks sponsor Coasterphobia classes on an irregular schedule. Others are sponsored by local groups such as coaster enthusiast associations. These classes tend to follow the basic tenets of other group seminars, and often build towards actually riding a specific roller coaster. Do your homework before paying for a class, though, to be sure that you are comfortable with the format, leadership, and expectations. Baby Steps: Systematic desensitization is an extremely popular therapeutic technique. If you feel comfortable on a smaller roller coaster, such as a kiddie coaster, you may be able to apply this technique yourself. Begin with a coaster that you are completely comfortable with so that you will have success. Ride that one a few times before stepping up to a slightly scarier version. If your phobia is not severe, you may be able to slowly convince yourself to ride even the biggest and scariest coasters. Take your time and never force yourself to do anything. Bring a Friend: A well-chosen support person can help you slowly work through your fears. She can preview each coaster before you ride, letting you know exactly what to expect. Your support person can also provide a hand to hold and a shoulder to lean on. However, it is important to choose your support person carefully. He should never try to force or guilt-trip you into riding or become upset by your decisions. At the same time, she should not be overprotective or try to talk you out of riding whatever you choose. Seek Professional Help: If your roller coaster phobia is severe, it is always best to consult with a mental health professional. Therapeutic techniques, combined with medications if required, can help you tame your fears and learn to enjoy roller coasters. This is especially recommended if your roller coaster phobia is based on another fear, such as claustrophobia or fear of heights. Minton, Eric. “Thrills and Chills.” Psychology Today. May 1, 1999. Ultimate Roller Coaster: Roller Coaster History. Should You Deal With Your Phobia on Your Own? Why Are Some People Afraid of Stairs or Slopes? What's Really Causing Your Fear of Cruise Ships?